There are a few differnent methods to screen printing depending on the textile that is being printed. It’s a process that’s been around since since 500 AD and became a highly developed art in Japan and China in the 1600’s. From printing on wood, various fabrics and textiles to printing on t-shirts, it’s longevity is a testament to it’s durability and it’s still the preferred method today among the largest apparel brand in the world today. While the screens are no longer made of silk, some still refer to the method as silk screen printing. It’s come a long way from it’s origins in today, in the t-shirt world, big things are happening through automation and quality. Automation generates speed and the faster we can print t-shirts less time it takes which in turn saves our customers money. The key to screen printing a good custom t-shirt begins with the artwork. The better quality the artwork the better the print. Artwork is output from a computer onto film which is used to burn the screens. 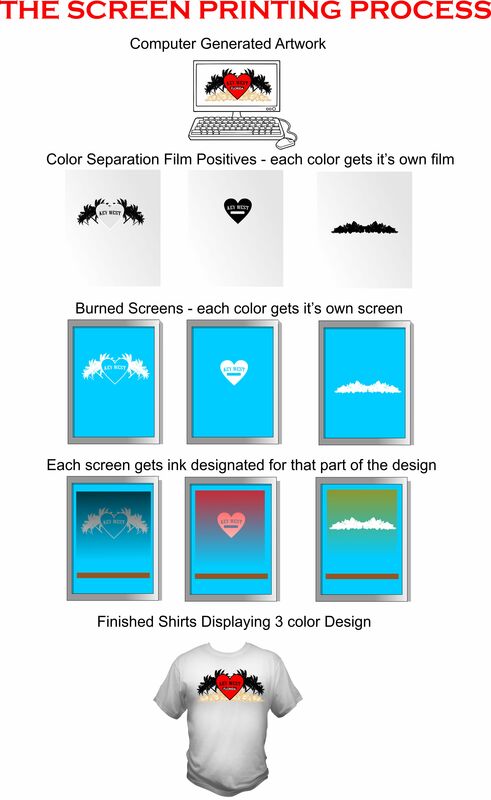 Any mistakes, blemishes, and errors in the artwork will transfer directly to the films which transfer directly to the screens and then the shirts. Ideal artwork will be high resolution graphics in what’s called a vector format. A file that is able to be color separated and scalable. As it gets enlarged it will not pixelate. The two main programs vector artwork is created is Adobe Illustrator and Corel Draw. Photoshop is becoming more popular but the artwork generated is color separated but not vector, rather high resolution raster images. The cleaner the artwork the better the screen print will be on your custom t-shirts during the screen printing process. Step Two – Generating film positives and color separations that will be used to burn the screens. Each print color requires it’s own screen. Step Three – Through a light table or other source of intense light, the film is overlayed on the screen. The screen is coated with a light sensitive material that leave a negative when burned on a light table. You are left with a negative image of your graphic which is where the ink goes. Step Four – Once the screens are burned the press is setup up, inks applied, and shirts are ready to print. Step Five – Once shirts are printed they are sent through a dryer with a heat temp of 320 degrees. The ink doesn’t dry, but cures rather. Once the shirt comes out of the dryer it’s ready to wear! Now there are a hundred little subletities that take place in all these steps such as choosing the right screen for a particular ink color or graphic. Figuring out the right print order for a multiple color job, the right heat temp, flashing, etc. Things a customer wouldn’t know or understand but play a vital part in the screen printing process. In order to get the best custom t-shirts possible you would want to use an experienced screen printer. In the end it will save you time and money and headaches. Like everything else, if the price seems to good to be true, you’ll probably regret the finished product.